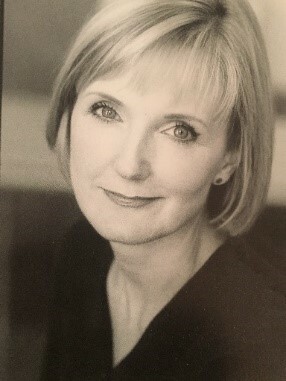 Tina Brock is the co-founder and Producing Artistic Director of the IRC since 2006. Over the past decade, she has directed works by Jean Giraudoux, Eugène Ionesco, Samuel Beckett, Christopher Durang, Edwar Albee, Franz Kafka,Tennessee Williams, Boris Vian, George Bernard Shaw, and Charles Mee, As a freelance actress in Philadelphia and New York, she has appeared in theater, regional a national commercials, television and film. As Producing Artistic Director of the Idiopathic Ridiculopathy Consortium (IRC), Philadelphia’s Absurdist Theater Company, my charge is to select which existential anxieties—and by that I mean which plays—our audience and our company will wrestle with during the artistic season. And while existentialist plays share a general theme of characters confronting the purpose of being head on, it’s exciting to see how these plays also resonate with time-specific flavor and relevance, given current world events and politics. Our heroes in the IRC’s current production of The Chairs contend with issues of aging, the boredom that comes from telling the same stories again and again, the sadness and loss that results from not having pursued the dreams commensurate with one’s talent, and the inability to share one’s special purpose with the world in a meaningful way. Add to that the universal fear of inordinate memory loss, the disappointment of unfulfilled expectations within ourselves and others, and the unalterable fact that we can’t define and control the life to come. 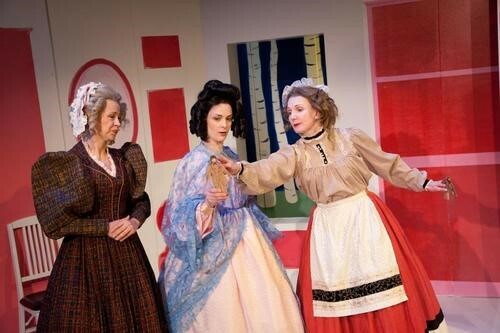 What makes it all theatrical (and entertaining) is that we behave as though we can. ​I was working in NY and Philadelphia, doing some television commercials, doing theater. I noticed a pattern that I was getting cast in -for lack of a better phrase, wacky way out there productions or as the wacky way out there neighbor. Crazy, kooky, funny. I was also cast in plays and become interested in the work of absurdist authors. At the time, I was taking a class with a teacher, George DiCenzo. He encouraged me to pursue that work. He said I seemed to understand it in a way that people don’t. Absurdism gets saddled with this idea, people read it in college or high-school and have trouble making sense of what’s on the page. The idea of how would I ever begin to direct this when people can’t understand it on the page, is a whole another question. My exposure to dance and other areas and the more, for lack of a better word, spiritual study brought me to the absurdist table learning this material and understanding it in a way that was easier for me than others. That’s the not so straight-ahead road that got me to this place. In 2006, we produced a number of short plays over L’Etage Cabaret that were short works by absurdist authors. I think we had Pinter, Ionesco, and Beckett in there. I was testing the waters to see the response from the community. It started out then and it’s had a nice forward trajectory of audience appreciation. So, if you build it, will they come – they did. Nobody was doing absurd theater, weaving their hand crazily to be the artistic director – so I jumped it. I think it’s really important work and work that this community is very interested in. It creates wonderful conversation. We have an offshoot programming where we do a bit of the works from Eastern Europe of absurdist authors - in that loosely defined school. We have a conversation part after the reading. It’s been tremendously successful. We just started but it’s been tremendously successful. That’s how I got started. There was no grand idea that I wanted to build the Taj Mahal and have a million dollars devoted to it. It was just let’s see what the response is and continue to challenge ourselves. For me the answer was more why than why not. Getting a theater company off the ground seems such a daunting task. Can you speak to what organizations, activities, and people helped you launch and sustain your company? Especially when you’re competing with New York. I’ll start off with the New York part. Back before the company started, that was part of the impetus for starting a theater company in New York. I didn’t’ want to have to always go to New York to see the things I wanted to see. The classically absurdist work isn’t done that much to begin with - though there have been many good ways on Broadway and off in the last 25 years. Although I love going to New York, that’s not a hindrance, we certainly have a place in Philadelphia that has many similarities in the education and the cultural aspect – I though why not see if we can make this happen here? Ironically, a large part of our audience now is New York and international. Either people who are here working short term or moved here from Europe. There’s sort of a kindred spirit there. I feel these are the audience members most likely to stay after the shows and talk to us about the material and write back to us about the material – and how happy they are to be able to find this material in the United States. We’re developing through our social media and our marketing efforts to really find out who are audience is. I think it’s largely people who are doing the same things I was 25 years ago in reverse. Taking the train down – they think the trip to Philadelphia is nothing. As far as the challenges, it’s really an interesting time. Over the last 10 years, that the company has been around – we were part of, even in the front end of, a great big explosion of new companies. I wouldn’t say things haven’t necessarily changed for us for our funding or difficulties because, while we get money from the city and the state, there are a number of smaller funders that are supportive of our work. We’re a just over a $100,000 a year company with three main stages. We also have other projects we do like the reading series called Into the Absurd. Some of the challenges are not necessarily the same as other companies. We’re a very very small company. We’re not even in the mid-size range. What we’ve done successfully has been and this has been very gratifying on a number of levels is - we have huge support from individuals. Between 70-75% of our support every year is literally from ticket sales and individual contributions. That then gets supplemented with our other funders. We’re sort of in that first tier of funding that you get – the FELS Foundation, the Charlotte Cushman Foundation. For a $100,000 a year company, a $3,000 or $5,000 a year grant is enormous. The Wyncote Foundation gives us a little bit of money. We haven’t yet taken that next step up to the next level of funding. It’s something on the horizon for us but there’s another set of requirements that needs to happen for that. You have to have an audit, for example, which is generally not something companies for our size. It’s something for $300,000 a year companies, according to the Bureau of Charitable Funding. What we’re grappling with is how large does our company want to be. I think one possibility is that it lies in the $250,000or less range. I don’t really see there being more than 2-3 staff members at most. Our current staff consists of three volunteers, no compensation. We do think it’s good for people to get paid. We do pay our designers and artists more? I was told by other companies - do you realize you’re paying your designers and actors comparable to a $600,000 to $800,000 company. It’s about what is the amount of time people are putting into this and what is the value we can afford to them. I think the design elements on the IRC and any kind of absurdist or surreal work are very important because it’s all of the elements combining to create a sensory and metaphysical experience which wouldn’t be the same without the sight, the sound, all of those elements. We’ve worked to make relationships with designers in Philadelphia, NY, and other cities. You can do that now because Skype allows you to have a production meeting where you don’t always have to be in the same room to exchange good ideas. What does make it easy is we’re really able to find people who want to work on this material because it doesn’t get done very often. That also applies to performers. Anyone working on the production, I try to pay those people well to compensate for the fact that our rehearsal schedule is unusual in that we don’t work three weeks, every day, for 40 hours. With our company, we work over a longer period of time to accommodate people’s daytime work schedules. So, there are very few actors, regardless of their talent level who make a full-time living at acting. Almost everybody works doing something else such as I did working several jobs, or after my son was born, taking full time work. With full-time work, it’s easier to have a dedicated place every day and then devote the rest of my day for the IRC. More and more, I see people working in this model. People and funders say you must pay yourself first but the company can’t possibly pay me what I make at the full-time job I’ve been doing for 25 years. I have a fundamental disagreement, because I do it, because I’m not driven by the money. There’s some argument for paying yourself something, even $5 a week, but with payroll and PayMasters, you’re paying yourself more to pay yourself than you’re earning. It's not all or nothing. Our team devotes every moment we have to the company because we think it’s important. I like to think it’s a bit of a cultural gem here. I don’t think good work has to all come down to money. Your plays focus on the Theater of the Absurd. When I look at the common denominators in many absurdist plays, one common thread is the idea of playing against expectations. In Beckett’s Waiting for Godot, the lines say – Let’s go. We must go. And the stage instruction is – they do not go. In the Bald Soprano, a man and woman, through their dialogue on a train, seem almost certain to be husband and wife – and yet they’re not. What’s the purpose of going against expectations? I ask that in two senses. The first is the overall purpose of the plays. What were the Absurdist playwrights trying to say about the world, about life, by constantly going against expectations.? The second thought has to do with the construct of the play and how it is performed. When you stage a play, is there this constant thought that if the direction gets too comfortable that something is wrong with the play? I was reading this book last night about the Avant Garde and the futurists. One of the things they talk about is that so much of the world is not linear. For example, I’m sitting here talking to you right now and I’m noticing there’s this hot sun on the side of my face and I’m hearing the noise upstairs and I’m thinking about all of the brightness in the room and how nice this table. All of those sensory things are happening. 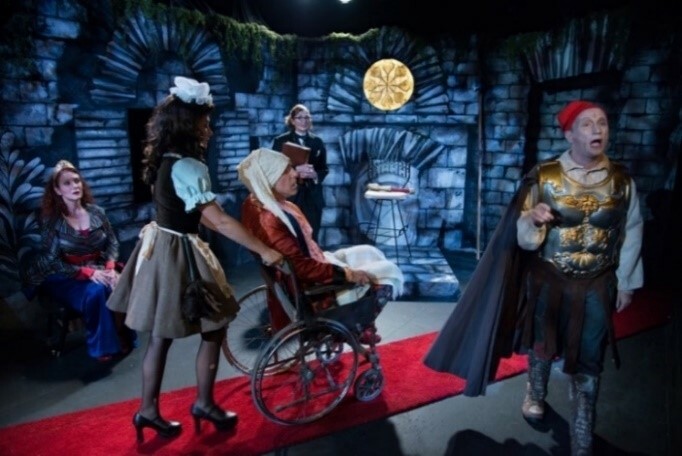 In the Boulevard Theater, as Ionesco referred to more traditional theater, the story has a definite beginning and an end, the story is told in a straight-ahead fashion and the play unfolds in a distinct way. Emotions don’t unfold in a linear fashion. We don’t necessarily feel sadness and only sadness. We feel sadness and happiness and despair at the same time. The most well-known works of Beckett, Waiting for Godot and Endgame, deal with what does it feel to sit in that feeling. The action becomes the non-action. My understanding of Ionesco and the Absurdist group is that they were tackling different things. And the expectation when these Absurdist plays first came out was to see the well-made play, a delineation of character, to understand motivation – and ask the audience to be OK with the anxiety that that brings up. When I look for actors, the task is a little bit different. Yes, it’s about timing and understanding musicality and flow – but they also need to be OK first and foremost with sitting in their own skin and feeling the anxiety that arises when as an actor, a character, and as an audience member – when they sit and wait for an hour and a half for something that isn’t going to come. As much as we know that nothing’s going to happen and as much as we know because we’ve seen the play before, and as many times as you’ve seen Waiting for Godot, the key ingredient for making a very successful production of that has to do with the acting and direction being OK without intellectualizing what is going on onstage. The expectation was that we’re going to see a development of plot, a development of character, we’re going to see characters we understand. When a lot of times, we’re getting archetypes, we’re getting representations of feelings of specific groups of people. In absurdist plays, the characters are often named just that – the man, the woman, the child, They’re something very religious, for lack of a different word, about it. We’re not really asking people to think. We want people to be able to shift with the unemotional pulse of the play. I see that as the part that is shattering expectations. 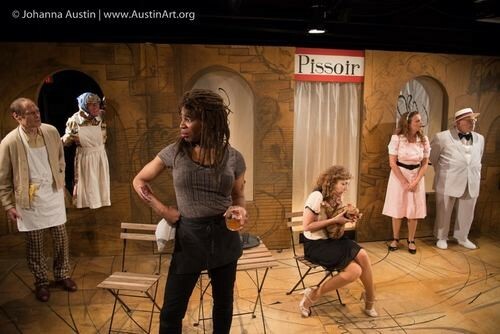 Absurdism asks the audience, asks the actors, and everyone to participate - because it’s a two-way street. It’s one of the reasons I enjoy doing these productions in almost too small spaces – is so that experience can be shared with the audience in a fundamental way. It was also giving people a place to go at the time, which is not all the dissimilar to where we are right now in that theater is a place to escape from too much of everything and appreciate There’s a freedom and joy in being able to sit there and appreciate that this is a limited time we have on earth -whatever you think of an afterlife. This is it. We’re going to be waiting and waiting and waiting. A professor, Enoch Brater, who taught theater at Penn back in the 1970s loved the works of Samuel Beckett. I remember him saying that the critics usually got Waiting for Godot wrong. He said the critics focus too much on the agony of waiting and the expectation that things will get better – or at least that they will change. His take was that Beckett wanted the theatergoer to recognize that the key to managing the waiting is to find ways to enjoy the waiting. If you’re waiting at the train station, have a book or magazine. If you’re waiting for a class to end, text a friend. While you’re waiting for events to happen, enjoy the little moments – otherwise you will really go mad. Was Brater right or are the critics right? That’s the bus I’m on. That’s what I see. I’m not, like much of the literature out there, that absurdist theater is nihilistic, for viewers thinking I just want to shoot myself in the foot. There was a lot of controversy when the John Goodman production of Godot was done – it was pretty brilliant I thought. Same idea when Bill Irwin did it in New York. There’s comedy to it. It’s funny. There’s something really hilarious about it. That’s part of living too. We’re passionate, we care. The election season is happening. There are important things that govern our lives but whether it’s sitting patiently and waiting or shaking our fist – in the big picture, it will all go by. But, I do think it’s important how we spend our time. I don’t focus on the end of it. I focus on the now of it, the sort of existential place that we’re in. I think there’s a huge amount of freedom in letting go of letting go and sitting under a tree and waiting for somebody who might or might not come. So what if they don’t come! What did you learn while you were sitting there? That’s the direction our company is trying to explore. In the execution of the work - allowing it to be of the moment where anything can happen. It doesn’t mean you don’t rehearse. It doesn’t mean you don’t try to lay things out carefully on the stage. But all the performers have to be willing to let go of expectations and be willing to let their emotional world go where it goes. It brings the audience in as well because it’s unexpected. It doesn’t mean there’s total chaos on stage. It means that within the structure you can let it pop. And then the audience is also brought in. It’s why Ionesco loved the Punch and Judy shows. There was something unaffected and passionate about it. Naïve and tragic in that they weren’t concerned with whether the water was running on stage or not. Another thought Professor Brater had about Beckett’s plays in particular was that part of the purpose of his plays was to break theater down into its most essential elements. Take away the plot, take away any empathy for the characters, use language that may not make sense – and you can still have a meaningful play. Is there any sense to the plays you’ve done that he might be right? The feeling is something we all know. It’s uncomplicated. To break things down, to compress them. Take what you just did and compress it, take the air out if it. The air doesn’t tell us anything. If you have five lines of text, in a psychological drama I might deliver two lines and then wait and there’s a moment between us where the psychological story gets moved forward based on our nonverbal reactions. In the absurdist world, the characters are mostly reacting from emotional impulse. In many cases, they aren’t thinking through what is to come. There’s something keeping them there, an emotional connection between the characters – whether it be despair, joy, or a little bit of hope when they think someone is coming. Isn’t that the way it is? If you’re breaking the story down in very simple terms and telling it as a parable of how we feel, I think that’s very very powerful for the audience. In the production of The Chairs that we just did, that’s all that it is. Just a bunch of large feelings out there on the stage for a long time along with some beautiful images of the chairs which stand in as individual people, perhaps past and present. I love the story of that play and the way it’s told. These works (Absurdist plays) require the audience to participate a little bit more. The ideas aren’t going to be delivered on your lap to you and it’s probably not going to let you fall asleep because it’s either going to be so loud or so fast or tumultuous on some level or it’s going to be silent, a quietly filled silence. Those are the states a lot of these Absurdist playwrights deal in. There’s something really seductive about either of those two places They resonate because they don’t require you to understand it intellectually necessarily. One of the things Beckett found out in doing Waiting for Godot at San Quentin in the 1950s was that intellectualism was a not prerequisite for enjoying the play. We have students coming from Temple, Penn, from theater programs, from philosophy programs, from urban studies programs, from community college of Philadelphia - who will say I don’t quite understand it but I was really engaged and it’s still making me think. That addresses a lot of what I’m hoping absurdist theater can do. Martin Esslin in his Introduction to Absurd Drama wrote “The shedding of easy solutions, of comforting illusions, may be painful, but it leaves behind it a sense of freedom and relief. And that is why, in the last resort, the Theatre of the Absurd does not provoke tears of despair but the laughter of liberation.” William Desmond, in Philosophy and Its Others, wrote of Beckett’s plays that “There’s an essentially comic and hence unavoidably and ultimately affirmative nature of his work.” Can you talk about the humor which is a big part of absurdist productions? Yes. The quotes are right. There doesn’t seem to be any reason in gilding the lily. If it’s already in the text and on the page, and the setting is already putting two tramps under a tree with very few leaves on it and nobody is in sight - I think we got it. In order to express that freedom that comes from not fighting. The greatest challenge is to accept and understand that our time on earth will be fraught. There is an endgame but that then shines a richness back onto our time here – that our days are valuable even if they are spent waiting. ​Sometimes the greatest revelations can come in waiting, We try to find that balance of humor and existential crisis, We have to be careful so that things don’t go off the rails – which can easily happen. There’s this idea that – it’s in the theater so let’s just act Crazy. Just look at the elections – this is real life happening now. This is not Punch and Judy. This is not Boulevard theater. When we first started in 2006, people asked is there enough Theater of the Absurd to keep people interested – which was a fair question because most people only know the classic works. We’ve now gotten to a point where what we do on the stage compares to real life. I love the Esslin quote. I love our audiences so much because they are willing to come and hold that mirror up to themselves and their lives. They have to bring their imagination and their heart. We see that in how they are willing to go on the journey with us. Our audience enjoys the journeys these authors from this loosely defined school from Eastern Europe and America take them. Our plays are personal to the audience. There’s not one ending to the play or one meaning to the play. Our Walnut Street state is a little bit of a too small venue because we have more demand than seats - but the smallness does help make it personal. The Absurdist movement has many European playwrights such as Beckett, Ionesco, Pirandello, Pinter, and Genet. There are also American absurdists such as Tom Stoppard and Edward Albee. Arnold Aronson wrote in The Cambridge History of American Theatre “Whereas Absurdism in Europe seemed a logical, almost inevitable response to the irrationality of war, the analogous elements that surfaced in American drama seemed more a response to a materialist society run amok. The American-style Absurdism seemed to spring full-blown out of television advertisements and situation comedies, which had become new myth-making machine.” Is Aronson’s analysis correct? In the case of the American, Albee, you can see characters that are easier to connect with. We just did one of his plays called The American Dream. A mom, dad, grandmom? Husband and wife. From that, he creates a dissonance. It’s a familiar environment. Pinter, the European, is known, in part, for the information that isn’t given – the Pinter pause. What is the menace that is happening in the room that is not being mentioned. Many of the characters in Absurdist plays are minor characters. They’re not the kings, queens, or aristocracy. They’re not the professional class. Why do absurdist playwrights like to tell their plays from the viewpoint of these offbeat minor characters. That’s why Bill Irwin and Billie Whitelaw have been successful absurdist plays performers. Billie Whitelaw was an actress in many Beckett plays. Do absurdist plays have stage directions that control the play? Where do you say – I have to be true to the script of the play and where do you say – I can put my own views into the staging of the play? There are a lot of interpretations. When you use a trashcan (as Beckett did in Endgame), what kind of trashcan are you going to use? A hefty one, a steel one. There’s a lot of range. I do think you have to honor the writer’s words and I do. At the end of the day, a trashcan is a trashcan with a container and a lid. The way I go about understanding the play and getting it up on its feet is you really have to focus on what is NOT said. What is the situation, the emotion? The words are the endgame of that anxiety, that existential crisis. The physicality, the movement, and the timing are as important as the words. Different playwrights are different. Ionesco was different, for example, He wrote that he’s going to say what happens, that I’m going to put all these ideas on stage because I can do that as a writer. I will trust that the director can bring all the elements into play. With him (and his Estate) it was about getting the “incredible lightness of being” of it. The key is to get the play in the air and keep it there like a ball in gym class. Ionesco saw his plays as sports, he loved sports. Plays should be like sports in that we show up and we don’t know what’s going to happen other than two teams are going to play and keep the ball in action. It’s that excitement that drives sports and any good theater production. So with Ionesco, there is more freedom. In The Chairs, we didn’t cut his text. I am considering some longer Ionesco plays where I would edit some of the text. Most absurdist plays aren’t that long – an hour and hour and half. Many plays have been successful movies. Do you think it’s possible to make a great movie of a theater of the absurd play – or is the absurdist play unique to the theater? Again, it depends on the play and playwright. In most absurdist plays, we’re trying to share something with the physical audience. We try to be very aware of the audience and the energy they’re giving you – even though we don’t formally speak to them. Each performance is different every night. The actors and the audience (my words) do play off each other. For the Mostel work, while sections were funny, I thought it lost a lot of the power of the play because a lot had to be cut. The Chairs would never translate to film. The interplay with the audience is just too important. The most talked about play this year is Hamilton. In many ways, it’s a traditional play. We know what happens because it’s a biography of a Founding Father. It’s based on a book by Ron Chernow. It’s a musical, a favorite American staging technique. And yet it does go against expectations in many ways. Nobody in conflict or even in love really breaks out into song or dance. The performers of the white Founders are mostly black. None of the Founders ever knew of rap music. It’s a fun play about someone who many think of as a boring banker. And the idea of a duel between the leading figures of the day seems – well patently absurd. 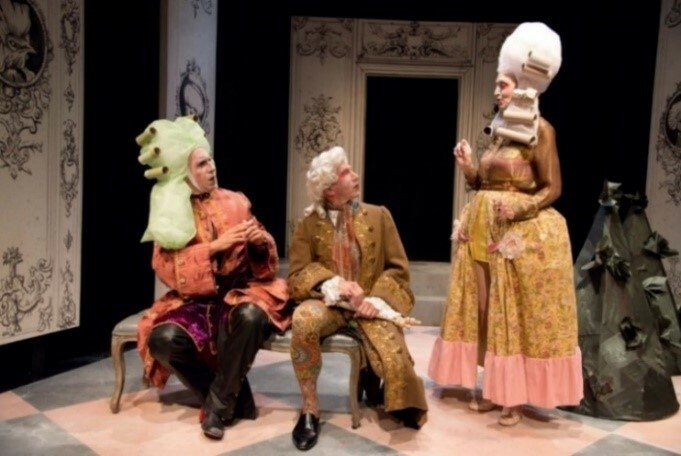 What does the Theater of the Absurd have to say about traditional theater? Hamilton is showing what audiences desire. Today things constantly shift, news is available at all times, our politicians can say one thing and then turn around and say another thing. Audiences now want to be challenged in the same way. I saw an amazingly taught production of a three and half hour play with three intermissions last year. It had absurdist elements as well where expectations were being changed. I can understand people reading the Bald Soprano or The Chairs and saying I had no idea what was going on. Well, they’re largely visual and felt plays. Those elements are now finding their ways into Broadway plays. Audiences are enjoying seeing expectations shattered because that’s what’s happening in real life. We had our first black President. We might have our first woman in the White House. We’re ready for change. The millennials are totally buying it. We have a huge audience of younger people. Can you talk about your audience? It’s a diverse audience. The common denominator is that they’re very adventurous – in an emotional spiritual way. They’re looking to be entertained but also looking to be challenged. They want to sit in audience with different people of different ages. We have high-school students, college students and older. They’re well-read but some/many haven’t visited these plays for a while. There are also the people who love it and want to know when the next show is. We try to introduce plays that aren’t as well known and to push the envelope on modern playwrights. Charles Mee s a modern playwright in NY. They’re poetic and spectacle – large scale. The Wilma does him well. Which play would you love to do – but you don’t because of production limitations? We were considering doing Pinter’s The Hot House but the Lantern got it and did a great job with it. Absurdist works either have two people in them or they have a village. They’re about silence or calamity. A sparse setting or the multiplication of things/objects. Another play I’d like to do is The New Tenant by Ionesco about a man and all his belongings are being brought in. The entire play is about the movers bringing in all these things. Before you know it, the stage is filled with all his possession while he’s trying to have conversations with band and manage his life. Another Ionesco play, Amédée, or How to Get Rid of It, is where a husband and wife have a conversation, and never leave their flat. She’s an old-time switchboard plug-it-in receptionist and he’s a writer with all these balled up pieces of paper. He can’t ever get going. There’s mushrooms from underneath the floor because they haven’t left the apartment for so long. The premise is that there is something in another room that they keep checking on – another person who keeps getting larger and larger and breaks through the wall as the play progresses. Some of the larger-scale spectacles I’d love to be able to do. What productions are you most proud of? All my plays are like my children. In Studio 5 at the Walnut, sitting in the back row is a much different experience than sitting in the front row even though the whole theater is just seven rows. I love to hear the audience response. Many people ask why this play now – most of the plays are old. But when I turn on the news, the plays seem relevant to me. Going back to the audience question, my audiences are willing to examine their world. 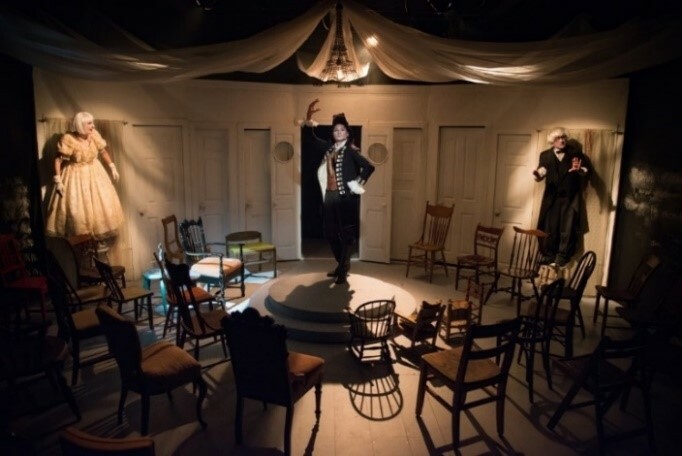 For the opening night of The Chairs, for example, the audience got the play – you could feel it. What was odd was one review cited the response of the people around them – wondering why they seemed to get the play, to be joyous about what was a sad situation in the play (the two people) and the reviewer didn’t. I think a lot of it comes down to being open to a different experience – which the reviewer didn’t seem to be. We do three big plays each year – two at the Walnut and one at L’Etage. We have our series called Into the Absurd – which are plays that we read and then discuss. Why the name – Idiopathic Ridiculopathy Consortium? I have worked for many years for the National Board of Medical Examiners as both a standardized patient and a case developer, writing the scripts for the standardized patients (and portraying the patients) who serve as test cases for medical students preparing for residency. During the time I was a standardized patient, I was also writing the draft of a play called Idiopathic Ridiculopathy, a farce about mayhem and mix-ups in a fertility clinic. Idiopathic translates to “no known cause of origin.” The diagnosis of Idiopathic Radiculopathy on the part of the student was referring to my radicular bone (rad as opposed to the rid in ridiculopathy). It was the collision of those live events: the exam, having just had a reading of my play, and thinking about whether there was a need for an organization in Philadelphia that would be devoted to absurdist causes that led to the name of the company. I was influenced by the work of Charles Ludlum, the founder of The Ridiculous Theater Company in New York in the ‘80s. I had always enjoyed his work. So, a combination of things. You resume says you have a degree in journalism and worked in the healthcare profession. How did you end up running your own theater company? Throughout my childhood and into my teenage years, I was always interested in performance. When I was a kid, I would gather up the kids in the neighborhood and every summer put a show in the back yard. A lot of the kids were pretty reluctant at the time. It was a variety show so there were all kinds of things; fire batons, dramatic sequences, dance numbers – and animals were involved. We would bring the parents together to watch. Our back-yard sort of had an upper plateau and a lower plateau – so it was our version of the Globe Theater. Every summer, this event would happen. So, that’s when my producing skills, or the nod to that, were being developed. In school, I tossed the idea to my dad – wouldn’t a theater degree be wonderful. He tossed it right back to me, he was a chemical engineer, and said maybe I could try something that would actually earn me a living. So, we put the theater degree on the second tier. I started out at the University of Maryland in journalism and always enjoyed writing. I got out of college and started working for a video production company and also worked at WHYY. I was in the public information and development department. I got a lot of knowledge and worked under some really good people at WHYY. I also did some on-air fundraising for WHYY. I was also studying in Philadelphia to continue my classes I’d started in school. I put together my own curriculum. I studied at the Wilma with a number of different professor. I continued my dance training including ballet training. I carved out a curriculum that I was able to do after work hours to continue my areas of interest.